AvantGarb designs & creates custom mascots. 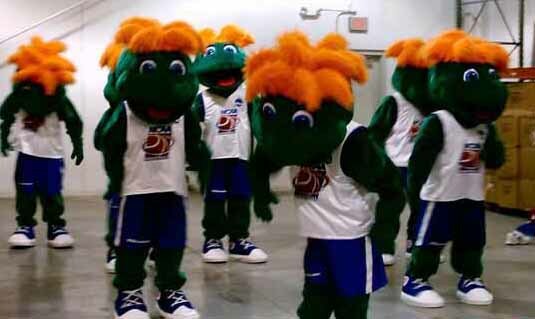 They are mascots that represent a team, school, event, product —even an idea. Each character is an original. We’re a dynamic company of artists, designers and craft people. Our raison d’etre, our training and our experience is in custom creations. There are companies that make many, many, many copies of the same mascot, and they do a good, efficient job. That’s not us. Mascots have a very, very, very, busy social calendar. The same mascot must be on the east & west coast at the same time. Our Mascot Mission is to be the physical marketing component for your marketing strategy. We strive to deliver countless hi-fives, hugs, laughs and “ooohs!” We resolve to be energetic, rambunctious and effervescent! This entry was posted in custom mascot, mascot design, mascot maker, mascots and tagged custom mascots, Hockey, J.J. Jumper, NCAA mascot, Racing beer cans, TiVo mascot. Bookmark the permalink. Well thanks! I’m glad you enjoy the blog. I enjoy writing it. Some just came by for a short meeting. She told me she talked about mascots for about an hour and a half at a dinner a couple of weeks ago. The mascotworld is a fascinating place!